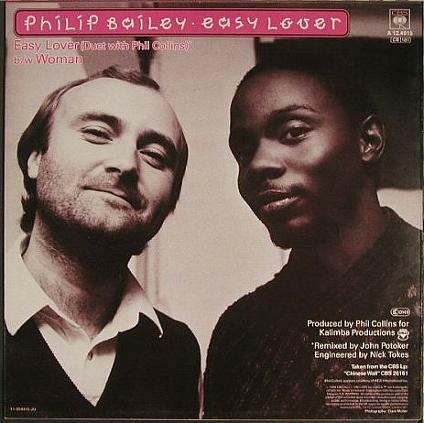 PHILIP BAILEY AND PHIL COLLINS "EASY LOVER"
This song was a huge hit during 1984 in the UK, selling over a million copies and staying at No.1 for four weeks during March and April. The duo managed to keep Alison Moyet off the top spot for two weeks with "That Ole Devil Called Love", and then Frankie Goes To Hollywood for another two weeks (they were looking to claim a fourth consecutive number one) with their single "Welcome To The Pleasuredome". "Easy Lover" also reached No.2 in the Billboard Top 100 charts in the U.S.
Before this hit, Philip Bailey was most well-known for being in the band Earth, Wind & Fire, where he shared the vocal lead with the founder, Maurice White. Easy Lover featured on Bailey's solo studio album Chinese Wall which was also produced by Phil Collins. "Easy Lover" was certainly one of the most danceable tracks of the decade, and no 80s disco is complete without it! The video is about the making of a music video, and the duo have a lot of fun together trying to perfect different dance moves. The start features the pair in a helicopter flying above London. The video won an MTV award in 1985 for "Best Overall performance in a Video".